Need a heavy duty trailer? Try this beefed up, 6000 lb. or 7000 lb. 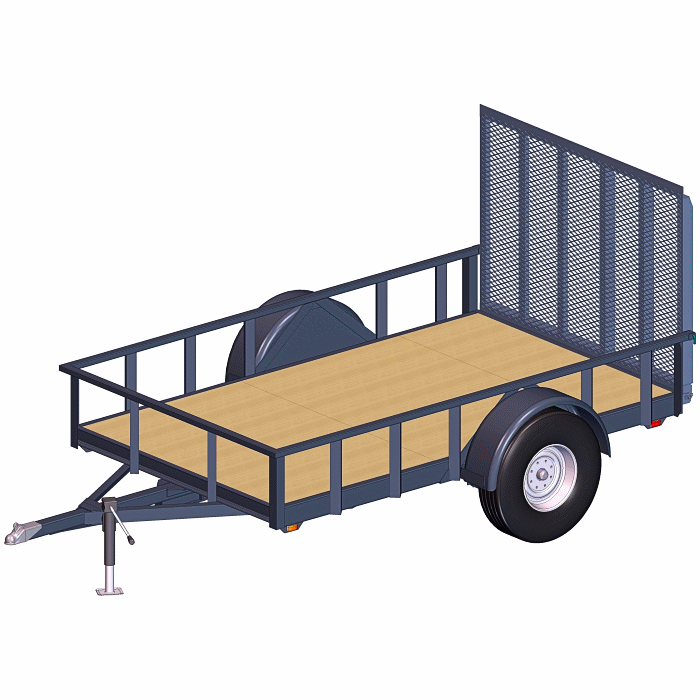 capacity, version — 6×10 Utility Trailer Plans. The design is tough, and the plans include many options to customize for specific needs. Maximize the usefulness or your unique heavy duty trailer, build it to your needs, and build it to last. 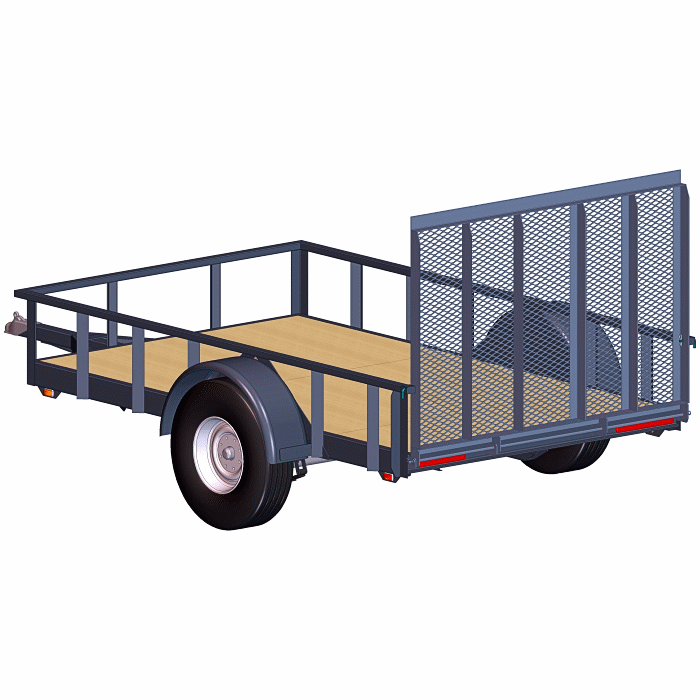 For a lighter duty trailer in the same size, see the 6’x 10′ – 3500 lb. plans. Or, for the next size longer, at the same capacity, check out the 6′ x 12′ Heavy Duty. Fully Engineered Heavy Duty Trailer Design. 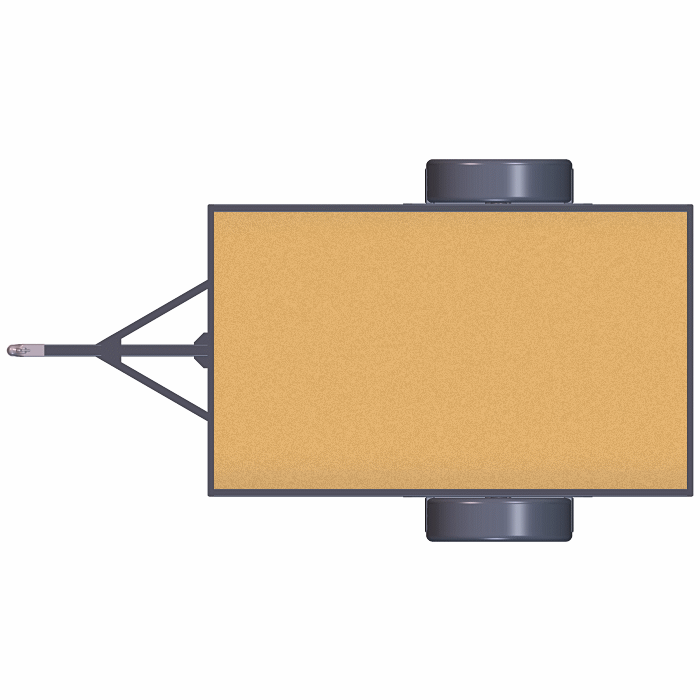 Single axle, leaf spring design. 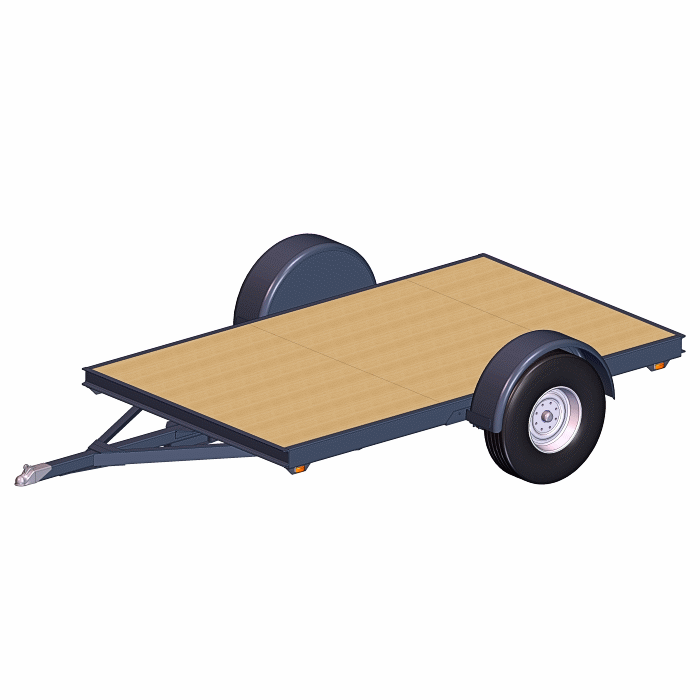 Heavy Duty Trailer with option for 6000 lb. or 7000 lb. Load Capacity. Includes the option for a fold-down rear Tailgate and Ramp combination. Has lots of options for trailer bed material and for tie-down places. Includes an option for a hide-under ramp, and for sides (or not). Build a motorcycle stand (or 2) to go with it – included in the plans. All our plans come complete with full drawings and illustrated instructions. 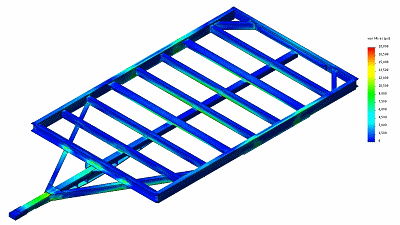 All our trailer designs include Strength and simplicity with standard beams, gusseting and triangulation for rigidity. They are strong, by engineering and design, starting at the frame, and they do not rely on sides to meet capacity. Yes, sides options are included, but they are not required. The frame is a solid foundation so the trailer will perform and last. Towing Stability, comes from engineering design fundamentals to tow easily. Though the plans include adjustable options for various load types, you can choose. Equally important is Maneuverability, so the tongue is long enough to give proper vehicle spacing. Design Versatility is in the plans — with axle and brake choices, load and deck height variations, sides (or not), a top (or not), and deck material choices. Options include ramps or tailgates like a fold down tailgate/ramp combination. — All are in the blueprints and instructions. Finally, there are options for Flexibility like a hidden ramp, motorcycle stands, an aerodynamic-ish front, toolbox mounting, infinitely variable tie-down placement, and more. Pictures show some of the options. While we encourage customizing, we also suggest these guidelines to think about. Plans include complete drawings and illustrations with the instructions — and construction tips. They also have a parts lists and a materials list along with suggestions for purchasing components. * Trailers built from these 6×10 heavy duty trailer plans have beds with an actual size 2″ wider than 6 ft. and 3.5″ longer than 10 ft. so the they give a full usable 6 x 10 deck — even with sides and tailgate. Length, including the tongue, is 175 inches or so (depending on options and parts chosen). Options for 6000 lb. or 7000 lb. capacity are in the plans. This is the maximum load for this heavy duty trailer, including the weight of the trailer. For a little lighter capacity, a 5200 lb. axle option can substitute in this same design. Finished weight depends on design choices, yet a typical flatbed sprung weight is around 800 lbs. Weight increases with certain bed material options, and things like sides, tailgate, toolbox, etc.. Many options are in the plans to give added function. Some options are mutually exclusive, and many options are not visible in the pictures. Choose customization for special uses – ATV & motorcycles, or trash, or furniture, or landscape needs. Reminder: Trailer construction requires metalworking skills and tools for things like cutting, drilling, accurate fixturing and set-up, as well as welding. 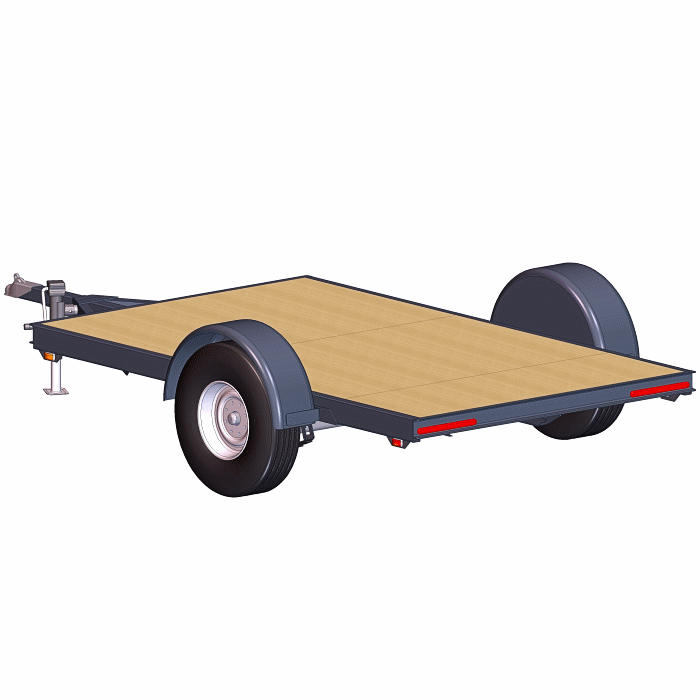 The strength, durability, and enjoyment depend on how well the trailer is made. Build it well, then Enjoy the Finished Project !! Purchase these plans with the “ADD TO CART” button above. Download is available right after confirmed payment. For more information about the plans, check out these two articles: What’s In The Plans? and What Makes Our Trailer Plans Better? Then, for more on trailers, try these two articles from Synthesis Engineering: “What Makes A Good Trailer Design?” and “Choosing The Right Utility Trailer”. * Trailer load capacity depends on all the parts — axle(s), components and materials — as well as the craftsmanship in building. All these trailers are engineered to perform as stated when built as defined, and when proper care is given in construction. Capacity for this trailer requires proper choices for parts such as the hitch, axle, wheels, tires, safety chain, decking, bolts, pins, etc. Please make sure load capacities match or exceed the trailer capacity, and Do not exceed manufacturers limits. 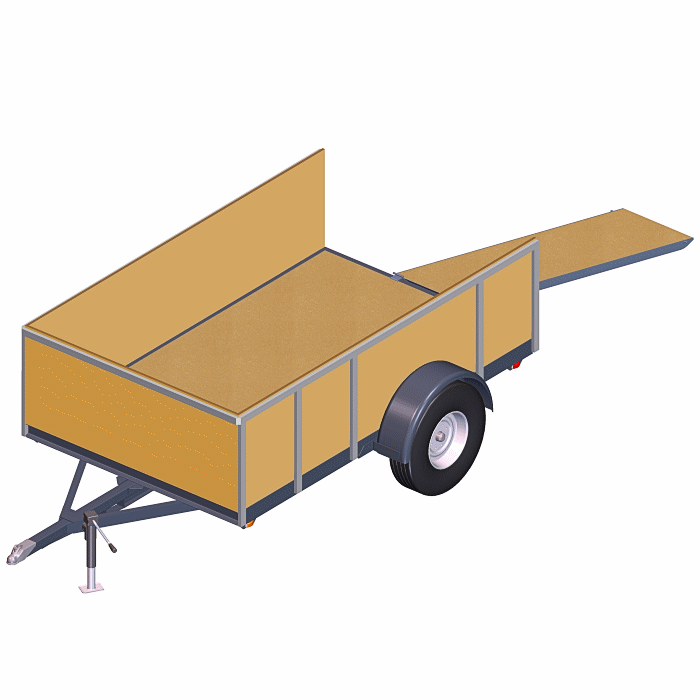 Success with the trailer — in building and for trouble-free trailer life — depends on materials, construction techniques, welding skill, assembly methods, finishing and proper loading. Proper frame set-up and weld integrity are critical, as are bolt torques, tire pressure, tire condition and the mechanics of towing. Always use proper safety and securing equipment when loading or towing a trailer. Build It Better Than You Can Buy It! And – Customize It – Exactly How You Want. What Is The Right Trailer Tongue Length? Mechanical Elements - Your Source For Do-It-Yourself Project Plans! A Service Provided by Synthesis Engineering Services, Inc.